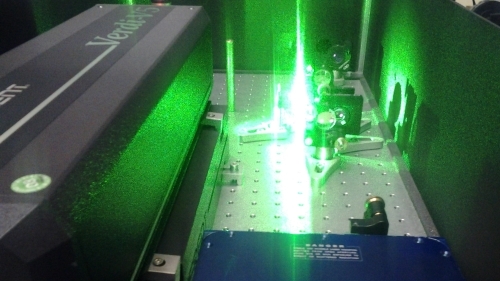 A tuneable amplified femtosecond laser source is available in the department (Ultrafast Photonics Lab). The source allow the generation of about 120 fs pulses in wavelength range of 550 nm – 2500 nm. Femtosecond pulses with their high energy can be utilised in different research field such as nonlinear photonics, pump–probe spectroscopy in photochemistry and nonlinear plasmonics. A tuneable amplified femtosecond laser source is available in the department (Ultrafast Photonics Lab). The source allow the generation of about 120 fs pulses in wavelength range of 550 nm – 2500 nm. Femtosecond pulses with their high energy can be utilised in different research field such as nonlinear photonics , pump–probe spectroscopy in photochemistry and nonlinear plasmonics [2-3]. E Fazio, A Belardini, M Alonzo, M Centini, M Chauvet, F Devaux, ... Observation of photorefractive simultons in lithium niobate, Optics express 18 (8), 7972-7981 (2010). A. Belardini et al. Circular Dichroism in the Optical Second-Harmonic Emission of Curved Gold Metal Nanowires. Phys. Rev. Lett. 107, 257401 (2011). A. Belardini et al. Chiral light intrinsically couples to extrinsic/pseudo-chiral metasurfaces made of tilted gold nanowires. Sci. Rep. 6, 31796 (2016).